If Beale Street could talk... it might tell Regina King to duck. King was almost tackled by NBA star Joel Embiid Wednesday night at Madison Square Garden. The Oscar nominee was sitting courtside to watch the New York Knicks take on the Philadelphia 76ers when she got the surprise of a lifetime. During the game, Embiid went after a loose ball and ended up running right into the crowd. 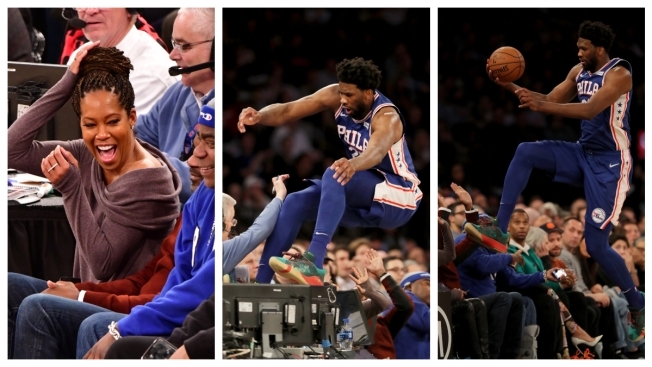 Luckily, instead of plowing right into King, who happened to be sitting there, Embiid was able to jump over the actress. Embiid actually landed on statistician who was sitting at a table beside King. Thankfully, everyone was OK after the impact. After seeing video footage of the loose ball moment, King took to Twitter to write, "Yoooo. Thank you God and @JoelEmbiid for your athletic abilities. Crisis averted." Embiid later liked King's tweet. This courtside incident comes just over a week before the 2019 Oscars, where King is nominated for Best Actress in a Supporting Role for her work in "If Beale Street Could Talk."